Platformers are a staple of the gaming industry. Quite a few games have defined the genre by mixing in elements from other types of games, but what happens when you add survival elements into the mix? 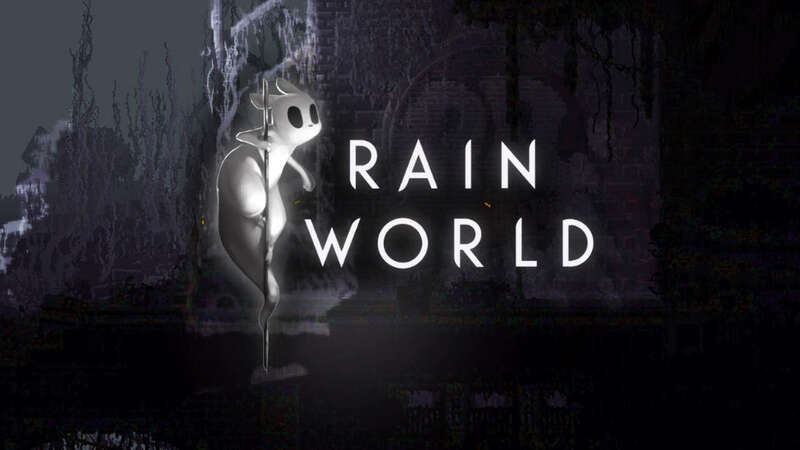 You get Rain World. While this title has a simple story, fun gameplay, and delightful art design, I found the general level design to be lackluster. Rain World’s plot is not complex, in the sense that you are one of three creatures simply known as slug cats, which have been separated from their family. From this point, your one goal is to try and survive until you are reunited with your lost familial unit. I found this setup to be perfect for the gameplay, which is explained in one cutscene. It lets the player focus on their end goal, which is something that I feel like is not seen very often, and I was pleased with the way they went about setting up this tale. I found gameplay to be rather fun, since it’s a mixture of platforming, and survival. Slug cats, while not the most agile creatures, are able to fit in tight spaces, swim, and use primitive weaponry. These skills are needed in order to find food, shelter, and to avoid predators and the deadly rainy season. The slug cat can hold two items in their hands, which you can use to grab food and hold weapons. While these basic spears and rocks are good tools for hunting and incapacitating enemies, the spears can also double as a platform in a pinch, especially if you are trapped with a predator and need to create a quick escape route. All of these elements combined created a lot of opportunities to use tools in the environment in creative ways that add to the replayability of different areas. I found that the art style was fitting for the atmosphere of the world our unfortunate survivor is forced to endure. I enjoyed the detailed backgrounds of a destroyed world against the feel of the various 16-bit sprites. I also enjoyed seeing the sprawling skylines of gray derelict buildings up against the bright greens of lush plant life. I found myself intrigued by this world, and curious as to what happened to the civilization that lived there before all of the wildlife had taken over. While there was a lot of fun in all of these elements, I found that the level design was lackluster. 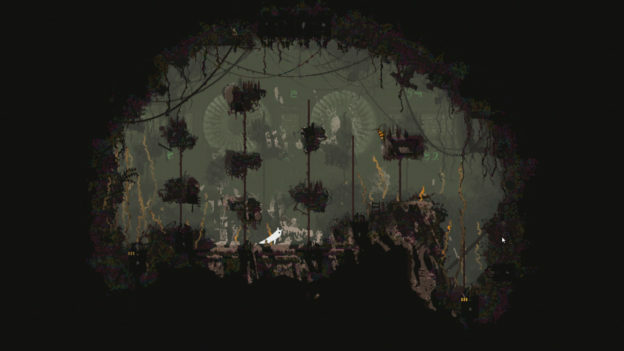 Rain World is similar to a metroidvania, in that there is a 2D open world for you to explore. This open-world structure seems fine at first, when you are getting assistance on where the main objective is located. Unfortunately, everything becomes overly confusing when you are left to your own devices and forced to navigate the map. While they did provide a map, I found reading it to be confusing I was forced to do a lot of backtracking in order to discover whether or not a certain room would have the exit to the next area. I found this running around in circles to be rather aggravating at points, and became disinterested rather quickly. 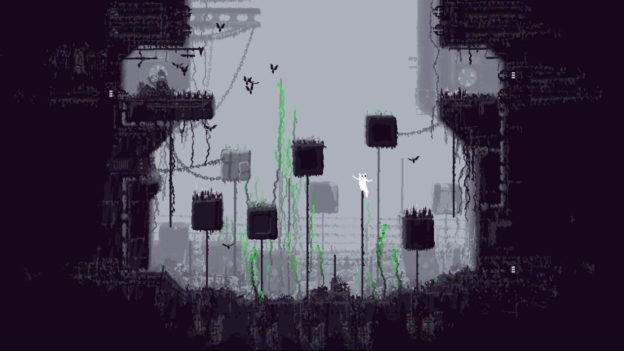 While I did enjoy Rain World for the art style and gameplay, I was bothered by the level design, to the point of boredom. While I don’t mind an open-world setting, I just wish that there was a clearer goal to where I was going. While I found myself coming up with clever tricks to get around obstacles, and enjoying the beautiful vistas, I just can’t see myself wanting to explore this world of torrential rain again any time soon.